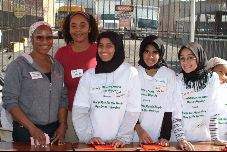 While government is otherwise engaged, Muslim groups are attending to the needs of the poor of Los Angeles. 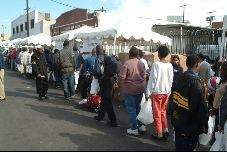 On Sunday, December 1, the Coalition to Preserve Human Dignity held a Health Fair for the Needy in downtown Los Angeles. At the fair, the Coalition made health screening, influenza inoculations, ‘hygiene packs’ (soap, toothpaste etc. ), blankets, towels, socks, bottled water and food available to the homeless. More than 4,000 people were helped. The following organizations are members of the Coalition: ILM Foundation, Systems for Human Empowerment, Islamic Relief, UMMA Clinic, Friend in Deed, Dawah 2000, IslamiCity.com, Inter-Faith Communities for Justice and Peace, Masjid Ibaadillah, Islamic Circle of North America, Muslim Public Affairs Council, Omar Ibn Al-Khattab Foundation, Drug- and Crime-Free Youth Foundation, Orange County Islamic Foundation, Inter-Faith Council of Orange County, Islamic Center of Irvine, Bilal Islamic Center Youth Group, Council on American-Islamic Relations, Common Ground: Muslim-Jewish Study Group, Muslim Student Association and American Federation of Muslims from India.